Thesis 2.0 is something I've based my refresh of basini.com on and so I wanted to review it. It's a bit of a departure for me but I wanted to share my views because this new theme system for WordPress seems to have really polarised people – some love it and some hate it! Let's start with some background. Many people run their websites using WordPress – which started as a blogging platform (and of course still is) but many of us use it as a quite sophisticated fully capable content management system for a website. If you are thinking of setting up a site or a blog then I would highly recommend WordPress. Now on top of WordPress if you want your design to be non-standard rather than the default you need a theme. There are thousands of themes for free that can make your site look great at the click of a button. For those that want even more customising then you can either buy a premium theme or a theme system. I've run my websites including Basini.com and for a while in the early days we ran ALLOW on WordPress and the Thesis 2.0 theme system. The previous version of Thesis 1.84 was a very easy and fast way to customise your site without needing any code understanding. As many of my regular readers will know I am an entrepreneur and marketer rather than a techie but I've developed and run many websites over the last 10 years (if you want to join my regular readers then sign up here). Whilst I have some level of understanding I don't like messing with code and when I have to it takes me loads of time which takes away from my content development. So I like systems like WordPress and Thesis which help me get a design and functionality I like easily. If you have a blog or website or are thinking of setting one up then go do it! It's great fun, you learn a lot and it doesn't cost very much money. It's a great way to build your personal brand and reputation, share your views and contribute knowledge to others. So what do I think of Thesis 2.0? Well at first I absolutely hated it! The previous version of Thesis was much, much easier to get your head around. Lots of options, easy to understand decision and simple layout. You could customise your site in a few minutes. The team over at DIYthemes and the genius Chris Pearson behind it promised an upgrade for years – I remember logging into the support forum and seeing loads of people asking time and time again for the next version for months and months – the consistent answer was, "it's coming". Then Thesis 2.0 launched in October. I eagerly installed it and it completely broke my site. I equally quickly uninstalled it and thought, "what a disappointment". However I have wanted for a long time to refresh Basini.com and so I looked again and installed Thesis 2.0 on a fresh version of WordPress and started to play. What is promised by Thesis 2.0 is that you get complete control of your site design and layout without having to know any code – powerful and simple. Unfortunately this isn't true – at least for someone of my level of web skills! Wrapping your head around how Thesis 2.0 works takes time and effort so the question becomes is it worth it? Well for perspective almost everything on the web promises to be "simple and easy" and in my experience rarely is – and Thesis 2.0 is no different. Of course some things are easier than others but all require you to understand, read, learn and experiment which takes time. In my opinion Thesis 2.0 is the same. It took me a month of playing – totalling probably 12 hours – to only start to get comfortable. I nearly gave up several times. I looked at competitor theme systems. Then the mist started to clear and I started to understand the way the new Thesis 2.0 works and it really is as powerful and customisable as Chris Pearson and the team at Thesis say it is. If you come at it from the perspective of an upgrade to Thesis 1.8 then this is probably misleading and I think makes it more difficult. Thesis 2.0 is completely new and different and, yes, better. Thesis 2.0 works through a drag and drop interface of boxes that make layout much easier once you understand how the theme works. It is more effort to set up the templates for your pages but it is much easier to set up the page you want and then apply styling to those boxes without having to understand HTML and CSS that much. Note however that as with everything on the web if you really want to get exactly what you want rather than a compromise then you will need to spend time learning about how things work and how to make the system work for you. For example I wanted to use some Google Fonts rather than the rather limited set of web-standard fonts, this requires you to add a line of custom code in the styling for each of the boxes that you want to use that font in – luckily this was covered in a blog post on the DIYThemes website and wasn't hard to do but you still needed to read and learn how to do it. You need to make some effort to understand how HTML and CSS work in order to get to grips with Thesis 2.0. This is where expert web developers (which Chris and his team clearly are) go wrong! They just don't understand how clueless the average person is – including me! For example the boxes in the template designer and the CSS editor require you to enter classes or IDs for these different boxes. Now its the most basic of concepts of HTML and CSS that you assign a class or ID and that then looks at the CSS for a style (i.e. formatting) to apply to the particular element – that's not hard to grasp but if you have never heard of classes and IDs then it can be confusing. As with anything new you need quite a lot of trial and error to understand and get it right but remember you are learning new skills all the time that you learn and play! If this review of Thesis 2.0 is making you think you'd like to have a go then I'm glad to say that there is more and more advice and support building all the time. When Thesis 2.0 launched in October there was very little advice but I've watched the great videos on Build Your Own Business Website, various videos on YouTube and the support forum over at DIYThemes has grown and grown with advice on Thesis 2.0. Now there is certainly enough to get you going as a non-expert web newbie. So does this review recommend Thesis 2.0 for non-web expert marketers and bloggers? Absolutely it does. It isn't as easy as promised but once you get the principles and have played around with it for a while then it is very powerful and allows you achieve a level of finish to your site that is really excellent. I'm really proud of the new basini.com – I hope you like it too! – it was achieved in about 20 hours of fiddling and experimenting with my site and Thesis 2.0 which isn't bad and allowed me to relaunch basini.com with a new design in about a month. 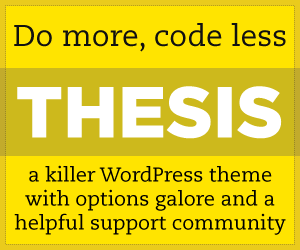 If you have a WordPress blog or site why not have a look at Thesis 2.0? NOTE: I am an affiliate of Thesis and so the links here are affiliate links. I recommend Thesis 2.0 because I have been a customer of DIYThemes for over 4 years and run my site on Thesis 2.0 and genuinely think it is a good product. Freedom – I’ve been thinking a lot about it recently. Last weekend, Remembrance Sunday in the UK, was a timely and sobering reminder that millions have sacrificed their lives to protect freedom for us and still do. But what are these freedoms that need to be so preciously protected? It seems to me that freedom is inextricably linked to choice. Our freedom is proved when we make the choices we do. We live today in a world empowered by technology which as well as offering us many new choices also limits our choices in ways that are harder to discover but no less important to discuss. As a result of our hyper-connected and hyper-transparent world we are simultaneously both liberated and shackled. We are liberated to share more freely, interact more diversely and access new and instant knowledge. These benefits however come with downsides, more of our time and attention is demanded leaving us more tired, more overwrought, more stressed than ever before. The choice to switch off from work is made harder by constant availability and speed; connections between people become looser and less meaningful as time spent together is replaced with more frequent, less direct contact; commercial communication and advertising bombards us at every turn cementing the consumer values of our society rather than citizenship. Beneath these more obvious negative impacts are also more sinister and more opaque influences on our freedoms. We now live in a world where almost everything we do and see is a consequence of our past behavior and decisions. This limits access to information, to services and removes the freedom that is to choose to change. See my review of the Filter Bubble – a great book exploring this. For example no longer do I see the same output from a Google search that you do. The Google algorithm uses everything it knows about me to give me the results it thinks I want to see and will click on. A computer is blindly making choices for me, filtering and changing my view of what is available in the world. If I am right-leaning in my political views I will see more positive results for David Cameron, if I am left-leaning then more negative. It makes it harder to determine the truth and make informed decision. Computers filter based on our digital footprints in the name of convenience, which of course we appreciate all the more so, because we are so overwhelmed. Extrapolate and you can imagine a world where the choice to access many products and services or be influenced or challenged with diverse viewpoints is largely reduced as it is filtered away either because they are unprofitable or just simply annoying. The available inputs that go into this customization of the world around us are gathering pace everyday. Almost every step of our lives is now recorded in some way. Our identities are virtual and our actions recorded. CCTV on the street, in shops and on public transport watch us. The internet records our every click and view, our email services record who we communicate with and what we say. Our mobile phones record where we are and what we are doing. And these bit of data are becoming more connected and aggregated with each other everyday. The industries that make money from all this surveillance progress three stock defenses: firstly that all this tracking is “blind” as to who we actually are, secondly it is more convenient and lastly that those who have nothing to hide have nothing to fear. These defenses are facile and disingenuous. Whether the identity is a number or address or even an anonymous click stream it takes very little effort to match it to a real individual and this is an increasingly important aspect of the industries that seek to exploit, aggregate and integrate information to make money. It only takes a few variations in the information, such as browser, screen resolution, location, and operating system to identity a specific computer or person and these are available to every website that exists. Convenience is also not a good enough reason to remove freedom to choose – life is diverse and whilst undoubtedly atomizing is still collective and community based. Our well-being and the social good is promoted by creating diverse interactions, information and experience. How much more sustainable would our banking model have been had it maintained contact with ordinary people and it’s social purpose rather than becoming myopic and mono-dimensional. The concept that this level of surveillance is not a problem unless you have something to hide is also dangerous and divisive. It appeals to our sense of right and wrong, or perhaps more accurately, it appeals to the self-righteous. We would do well to remember that centralized intrusion and collection of intelligence on what an individual’s views were and what this could mean about their intentions was crucial for the Nazis in 1930s Germany, the Stasi in communist Russia and the fear and obsession of McCarthyism in 1950s America. On a less macro level our digital footprints also lead to security and identity risks. It’s these macro and micro risks that led the European Convention of Human Rights to enshrine the human right to privacy. It should worry us deeply that the ability to track and record en mass has proved too tempting for the UK Government who are trying to ensure that up to three years worth of internet, email and other electronic footprints are stored on the whole population “just in case”. They claim that this intrusion is justified in the fight to protect freedom. It isn’t. It seems to me that freedom is to be in control, to be empowered with time and knowledge, and so be able to make the right choices for ourselves. The technologies we have today help connect us broadly with each other and provide access to thin convenient slices of knowledge, the growing opportunity is to help us control these technologies and the fears they create, thus allowing us to gain more freedom over how we choose to spend our time and energy. WHAT EXACTLY IS THIS THING CALLED CONTENT? The latest buzz Content and Content Marketing? I’ve been thinking a lot about the latest trend of content marketing because it has been so important as a driver of quality traffic for ALLOW. I define content as anything that I can create or co-create that engages with an audience. I exclude our product features per se although talking about our product features and content associated with them is part of our content marketing strategy. We use content frequently to educate our audience and exemplify the need for our product, we also use it to explore issues with the community of interest that we have gathered around ALLOW. The results have been outstanding. Content led visitors to the site spend over 5 minute which is 300% better than PPC or display. They are more likely to convert. The best audience conversion comes through social media backed up by organic SEO. We have tried many different types of content and all work well, with video being a particularly strong performer but even the standard blog post (image + text) is effective. We seek to share our opinion, progress, news and education through our content and we keep sales messaging to a real minimum if at all. Content and content marketing works in my opinion because it is a gift from your brand to your audience. It shows you want to engage, share and give back. It’s part of a strategy moving from mass communications to mass interactions which I talk about in my trust building book – Why Should Anyone Buy From You? Got a comment? What is your content strategy? CopyBlogger as always is ahead of the game for content marketing – it’s a great guide. Thanks to Amelia for prompting this post. Posted on November 20, 2012 November 28, 2012 Author Justin BasiniCategories Advertising, Brand, MarketingTags allow, amelia torode, content, content marketingLeave a comment on WHAT EXACTLY IS THIS THING CALLED CONTENT? WOULD ANYONE CARE IF YOUR BUSINESS DISAPPEARED? There has been lots of good (and lots of rubbish) written about the (in)famous net promoter recommendation question – “would you recommend us?” Fred Reichheld made the question famous in his book called it the Ultimate Question (click to see the book on Amazon). Yesterday I met up with Kate Cox from Media Contacts to discuss their up-and-coming conference on Meaningful Brands which I am delighted to be speaking at in February. The research they have done is to ask people “meaningful-ness” questions about the brands they use. Would you miss the brand if it disappeared? This question has a real power at getting to a deeper connection. Would I really miss Ariel or Persil? Not so sure. Would I miss Pampers? Perhaps. In our hyper-competitive world every product is replaceable. Innovation doesn’t stay unique for long. I can get a great smartphone or washing powder from many brands. They all work broadly the same. But would I miss the drive and inventiveness of having the Apple brand in the world? Yes I think I would. Would I miss John Lewis and what it stands for both from a retail perspective and it’s unusual co-operative structure? Again I’d certainly miss it alot more than if Debenhams went bust. Would I miss the Guardian’s drive for the truth and their inventive use of new media models? Yes because I think our society would be worse off without them in it. We miss Cadbury in a post-Kraft merger world because an outstanding British business of over 100 years got consumed by a faceless US corporation. It was taken away and people miss it. The products are still in our lives but they are somehow less authentic and meaningful than they were before. The brands that stand the “would you miss it” test have gone beyond the benefit. They have started to create connections that are more than just what they deliver. Whether that is by virtue of their vision, the way they do business, their pursuit of something difficult or their history these businesses mean more to us than just their product. Would anyone care if your brand or business disappeared tomorrow? Posted on November 7, 2012 November 26, 2012 Author Justin BasiniCategories Advertising, Brand, MarketingTags brands, emotional, Iconic, rational, reaearchLeave a comment on WOULD ANYONE CARE IF YOUR BUSINESS DISAPPEARED? I spotted this in a Cafe Nero – seemingly the cost of screens is falling so much that they are popping up everywhere. My book was a conference give away at the Meaningful Brands Conference – given away to a 100 top marketing and media folks!